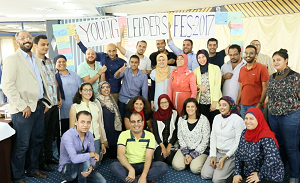 The young leaders program (to support youth capabilities) or "National Young Leaders Network" of the FES is a program to be implemented in the North Africa and Middle East region in several countries (Egypt - Jordan -Morocco - Tunisia - Lebanon – Algeria – Yemen -Palestine – Libya – Sudan), which aims to enhance the capacities in the fields of economy, sociology, political science ... for young people in the region. Youth in Egypt face the reality of poor education and limited access to vocational training, education, volunteering, and job opportunities. FES Egypt has an interest in working with youth through the various activities it conducts. 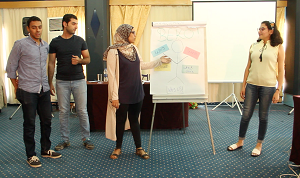 Given the profound interest and work on youth empowerment for years in Egypt, FES developed a Young Leaders’ National Network program, where participants will be encouraged to design and implement their own micro socio-political initiatives. 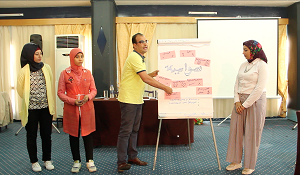 In March 2016, the Friedrich-Ebert-Stiftung Egypt office held a selection conference for selecting the participants as a part of the young leader’s capability building program of the Foundation. 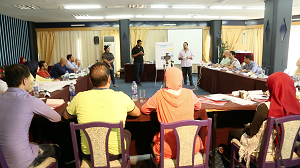 A selection committee consisting of a group of specialists in consulting and training, selected 35 out of them to participate in that young leader’s program, where the program started in April 2016 and ended September 2017, though which the participants attended several workshops to get qualified to become active members in the community. This program aims to enable young potentials to become competent and reliable leaders, to qualify a selected number of young people may hold leading positions in the social and political life of their communities, so that they will be able to meet the challenges facing their countries and be able to play a significant role in the democratic transformation that is already taking place. In September 2017, this program ended by handing over to the participant certificates for the appreciated successful and committed participation throughout the full program.